Oh, the lowly placemat. It sits underneath our plates, garnering none of the attention reserved for the attention hog that is our dinner plate. (Even more so if actual hog is involved). Whatever pork dish you may prefer, it will have to share in the limelight if you are using these LED Placemats from Sylvania. 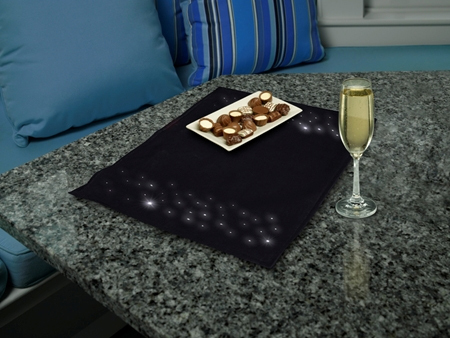 Operating on a button cell and offering up to 20 hours of battery life, the placemats twinkle and shine, gently illuminating your meal. As romantic as glimmering novelty placemats may be, I don’t think candle makers have anything to worry about quite yet. That’s one way to keep the spark alive! Parents: should you be wary of whiffing?